Thank you for your trust in our company and for buying your new Energy Earphones. We hope you enjoy them. We recommend you to read this quick guide to familiarize yourself with your earphones before using them. Do not expose your earphones to impacts, dust, humidity or high temperatures. Do not disassemble the device. All modifications are to be carried out exclusively by qualified staff of Energy Sistem Technology, S.A.
Avoid pulling and twisting cables to extend the life of your earphones. 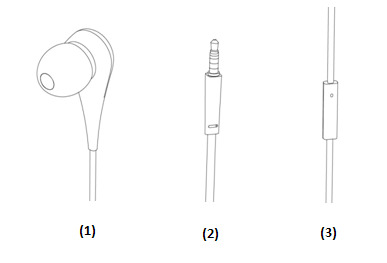 Plug the 3.5 mm JACK CONNECTOR (2) of your earphones into the earphones input of the device that you are using to play your music. You will be able to control your calls from your earphones if you plug them into your mobile phone. Press the MICROPHONE (3) button once to answer a call. Press and hold the MICROPHONE (3) button for approximately 2 seconds to end a call. Press and hold the MICROPHONE (3) button for approximately 2 seconds to reject a call. *Controls may vary depending on the settings of the device that you are using to play your music. Before using the earphones, turn the volume down and turn it up slowly until desired music level is achieved. Avoid noisy environments that force you to turn up the volume really high when using your earphones. Listening to loud music through earphones over a long period of time may cause your ears to get used to high volume levels, resulting in irreversible hearing loss. Adjust the volume of your earphones to be able to hear important external sounds. Energy Sistem Technology, S.A. is liable for any lack of conformity that exists at the time the goods are purchased during a period of 36 months. Please visit http://www.energysistem.com/en/support and select your product to view the FAQ (Frequently Asked Questions), user manual, quick guide, drivers and updates available as well as to submit a query to our Technical Support or manage the warranty. You may also contact the distributor that sold the product by presenting the purchase receipt or invoice. All company, brand and product names are trademarks or registered trademarks of their respective companies. Specifications are subject to change without notice. Issuer’s name: Energy Sistem Technology, S.A.
in conformity with the essential norms and standards of the Directive EMC 2014/30/EU of the European Parliament and of the Council of 26th February 2014.